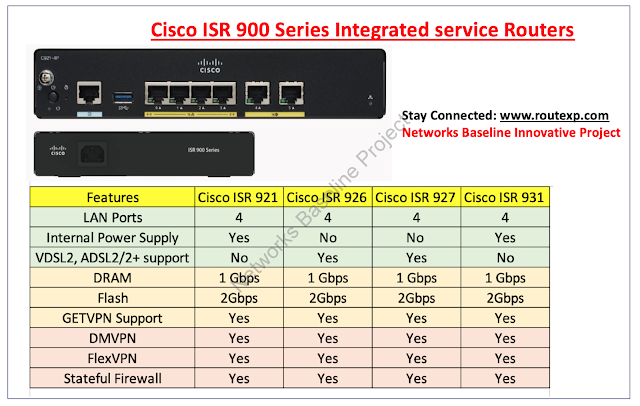 Today I am going to talk about newly launched Cisco ISR 900 Series router. We will talk about the available options in Cisco ISR 900 Series router and also talk about the capabilities and features of Cisco ISR 900 series router. What are the various models of Cisco ISR 900 series router? Cisco ISR 900 Series routers come with a 4-port managed switch, delivering LAN ports to connect numerous devices and up to 250 Mbps of VPN output for high performance. These are mighty fixed- configuration routers offer protected broadband, Metro Ethernet, and DSL connectivity. The routers bring incorporated security and threat defence defensive networks from both known and new Internet vulnerabilities and attacks. All Cisco ISR 900 routers have maximum support of 50 VLANs with 2 Gbps of Flash and 1 Gbps of DRAM. All Cisco ISR 900 routers have security features like GETVPN, DMVPN, FlexVPN and stateful Firewall support inbuilt.